In early 2017, artist Kelly McKernan began a Patreon Project to illustrate a Hanafuda card deck. Hanafuda cards are of Japanese origin, born in a time when Japan closed its borders to outside influence and prohibited playing cards that resembled Western style. Of the many iterations of playing cards that were banned over the centuries-long seclusion, Hanafuda cards succeeded in remaining under the radar of the Japanese government, as the cards were entirely made up of illustrations inspired by nature. Subsequently, they were used primarily in gambling by the criminal underworld. It wasn't until the Nintendo Playing Card Company (yes, that Nintendo) was founded in 1889 and produced hand-crafted Hanafuda cards on mulberry bark, that card games became popular again, and the Japanese government relaxed their stance on playing cards. 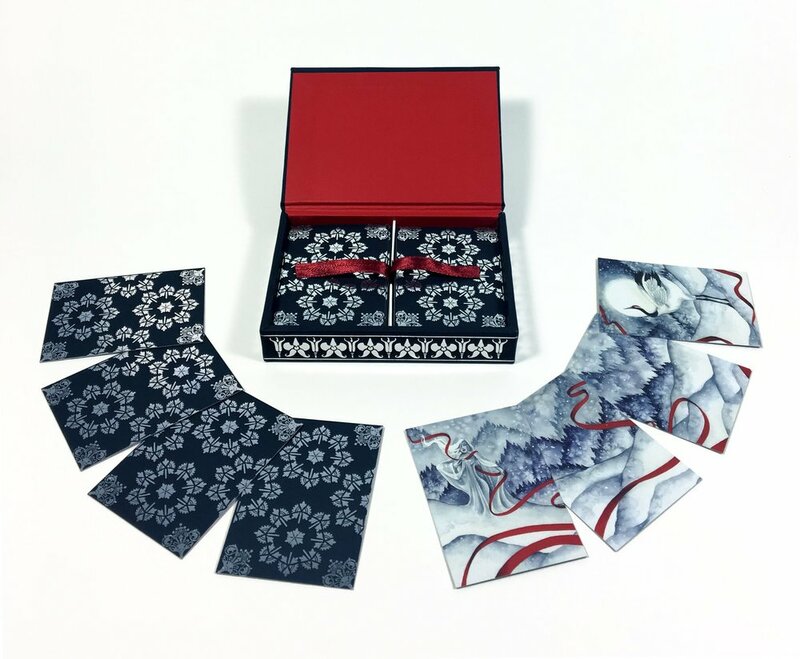 A Hanafuda card deck is comprised 48 cards, including 12 suits, each represented by a month of the year with corresponding plants, flowers, animals, and ribbons. Each suit contains four cards, given different point values to be used in various games such as Koi Koi, Go-Stop, and even Solitaire. Don't worry if you aren't familiar with these games! An instruction sheet will be included with the "Interlude" deck. Kelly chose to illustrate her own Hanafuda card deck as a personal, long-term project for the 2017 year, with the purpose of challenging herself to put her own stylistic spin on the traditional illustrations used in Hanafuda cards. Following the requirements of the Hanafuda deck, Kelly set out to create 12 watercolor paintings for each suit, which are then divided into the four cards required per suit. On November 9th 2017 Kelly brought "Interlude" to life on Kickstarter with the help and support of her backers! You can now pre-order this stylish, modern take on the traditional Japanese Hanafuda playing cards over in her shop! Mini print sets and several originals are also available! *Click any thumbnail below to reveal the entire image.